What could be better then natural shaving products that are good for the skin, wallet and the earth?! San Francisco-based Pacific Shaving Company has been developing natural personal care products (for men and women) that are good for the skin, good for the wallet, and good for the earth since 2002. They use certified organic, natural and naturally-derived ingredients, environmentally friendly practices, and minimal packaging. Their shaving essentials take up a fraction of the space of traditional shaving products - all fit within TSA carry-on restrictions. Here is my review. I love this concept! What could be better then a travel size oil you can slather on and use at home that's small enough for travel and lasts up to 100 shaves? 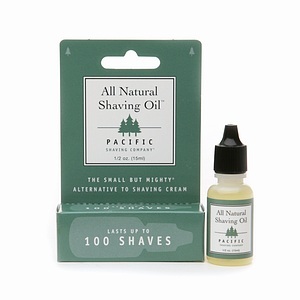 If your a person who likes everything simplified, I recommend you try All Natural Shaving Oil. Made from essential oils, this tiny miracle works wonders for both men and women on even the most sensitive skin. The shaving oil provides a consistently smooth shave that will leave your skin left conditioned and moisturized, not oily. It also applies clear so you can finally see where you're shaving - particularly great for men shaving around blemishes, sculpting a beard, moustache or even shaving your head. The benefits of using the shaving oil are fewer nicks and no razor burn, leaves skin conditioned and moisturized, you can actually see where your shaving and there's no mess when finished. Pacific Shaving Company says this is the best shaving cream period, and I agree. This is my favorite from the line and I couldn't believe how incrediably smoothe and soft my skin was after using the product. With natural and certified organic ingredients, their unique, low-lather formula is about to become your skin's best friend. The benefits of using this All Natural Shaving Cream are softer whiskers and superior lubrication, healthy, hydrated, soothed skin, and protection from harsh environmental factors. The 3 oz. jar will last up to 40 shaves! I love this idea! Especially when it cuts my razor blade expenses in half! Blade Oil works well with all razor blades, is a no mess application, travel friendly, is made with safe and natural ingredients, and gives you a one year supply! Using safe and natural ingredients, Blade Oil™ has been clinically shown to slow the effects of oxidation and extend blade life by up to 95%. This saves you money and produces less waste. Pacific Shaving Company is also partnered with Trees for the Future to plant a tree for every bottle sold and the Today Show has ranked us as one of the top 12 eco-friendly gifts under $50! To learn more and get yours, please visit their website at http://www.pacificshaving.com/.